A new service branch, responsible for information security, would be added to the Russian army as soon as this year. 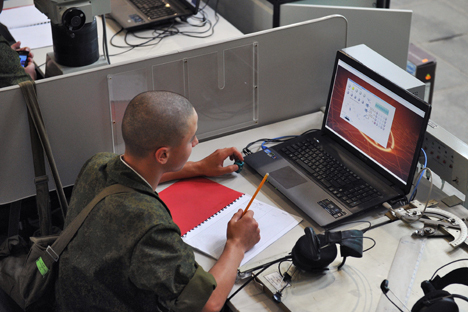 By the end of this year, Russia’s armed forces will get a new service branch responsible for information security. Officers serving in the branch will be required to have a linguistic background. President Vladimir Putin believes that the “firepower” of information attacks could be higher than that of conventional weapons. President Vladimir Putin stated on Friday, July 5, that it was necessary to counter cyber threats effectively. “We have to be prepared to counter threats in cyberspace effectively, to improve the level of protection of the relevant infrastructure—above all, information systems of strategic and mission-critical facilities,” the head of state told a Security Council meeting dedicated to improving Russia’s military organization through 2020. Putin reminded his audience that “information attacks” were already being used to achieve military and political goals. He also noted that their “firepower” could be higher than that of conventional weapons. A source at the Ministry of Defense told RIA Novosti that a service branch responsible for the nation’s information security would be added to the Russian army as soon as this year. Officers preparing to serve in this branch will require linguistic training; they will have to learn a foreign language, primarily English. This matter was first brought up for broad discussion last spring, according to Deputy Prime Minister Dmitry Rogozin. Minister of Defense Sergei Shoigu asked several General Staff divisions last February to complete the development of a cyber command. Alexander Sharavin, director of the Institute for Political and Military Analysis and member of the Academy of Military Sciences, claims that the Ministry of Defense received proposals on creating such a command 10 years ago. “A concept for using cyber weapons was developed six or seven years ago. Today, this sort of weapon is second in importance only to nuclear arms,” Anatoly Tsyganok, director of the Center for Military Forecasting and lecturer at Moscow State University’s Global Policy Department, told Vzglyad. “Cyber weapons are widely used in military conflicts, most recently during the U.S. intervention in Libya, where they controlled not only airspace [...], but also telecommunication networks. They were hacking into Libyan TV networks to broadcast programs for the local population,” said Tsyganok. According to the expert, Israel leads the way in this area, having implemented advanced digital technology in 2005. “The American protection ranks second, followed by Western Europe’s,” Tsyganok said. During the same week, Shoigu asked his associates to locate the students of one St. Petersburg university, which had won a global computer programming championship for the fifth time. “I heard on the TV today that students at a St. Petersburg university won the global computer programming championship for the fifth time. We have to find them. We have to work with these guys somehow, because we need them badly,” the minister said in early July, during a meeting with university rectors and the public on the subject of science units in the army. “The minister of defense has asked me to meet these guys personally and tell them about military-related software development projects that we are actively carrying out,” Deputy Minister Oleg Ostapenko told journalists on Friday. He added that solving these problems requires supreme skills and unconventional approaches to developing optimal algorithms for subsequent programming. “These are the exact qualities that have always been characteristic of the Russian programming school, which enjoys a stellar reputation among major software developers around the world. Perhaps these guys might be interested in some of our projects,” Ostapenko was quoted by RIA Novosti as saying. In this case, Ostapenko said, the Ministry of Defense would be ready to offer them the required conditions, including project finance (at least at the market level) to create an environment for effective work.